This reunion was well attended and with many wonderful memories to cherish. DON'T FORGET FAMILY THAT REGISTRATION RATES INCREASE AFTER MARCH 1, 2012, NO EXCEPTIONS!! So send in your payments now to avoid the rate increase! Also please use this updated registration form so that we can know which activities you will be participating in. 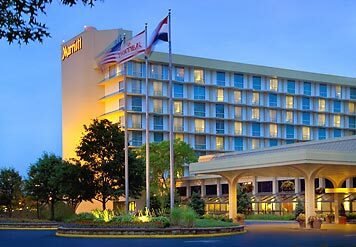 This wonderful family affair will take place at the St. Louis Airport Marriott. Single Room: $79.99 plus tax Double Room: $79.99 plus tax. You must make your own room reservations. There are 40 rooms blocked under “O’Kelley Family Reunion”. Ask for the newer section, King Marquee Tower. Call early and reserve @ (877) 264-8771 or (314) 423-9700. 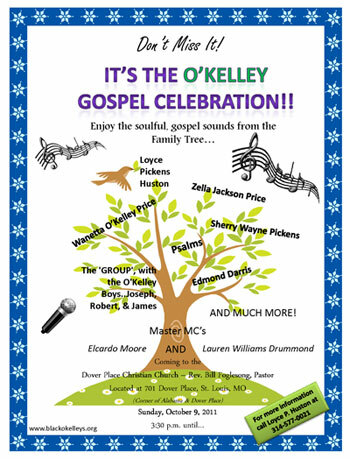 The St. Louis O'Kelley Reunion Planning Committee hosted "and starred" in a fantastic Gospel Celebration Show on October 9, 2011!